Card Hunter releases on the 12th of September! Woo! Double woo! We have exciting news – Card Hunter will be officially released on the 12th of September 2013! We used to call this “going gold” in the Jurassic era of video game development. How quaint! In this confusing age of never-ending betas, we thought we would strike a blow for clarity and just declare Card Hunter live. First of all, thank you so much to 40,000+ folks who participated in the closed Beta. Vicious Thrust is too vicious! The Trogs are too hard! McDonagh, your grammar is atrocious! We heard you. We tracked your data. We argued long and hard about what it all meant. You helped us squash bugs, balance maps and improve the game. Thank you for being part of building this game. We couldn’t have done it without you. Also, a very special extra “thank you” to everyone who purchased pizza during the Beta. We really appreciate the help you gave in funding this game through its development. From now on we’ll be removing the special Beta figures from sale, so if you got these you’ll always be part of an exclusive club. So, what does “Live” actually mean? From Thursday the 12th of September, anyone will be able to register and play Card Hunter at www.cardhunter.com. The game will be officially live! Monsters will be afraid and dungeons will be looted. Gary will be delighted with his new friends. Melvin will be mildly appalled by the influx of new players. There will be a database reset for all existing Beta accounts. There won’t be any more resets after this, so now you can start card hunting for real. It’s sad to have to do this and we considered not resetting the accounts but felt that would be unfair given our pre-existing commitment to the next point. After the reset, any Pizza you purchased during the Beta will be refunded and you can spend it again. Yes, that’s right – all purchased pizza will come back into your reset account ready for you to use it again. If you have an existing Beta account, you can just login and play again as you did in the Beta. Your account name and password will remain unchanged. The game URL will still be at live.cardhunter.com. We will be taking the server down late on the 10th of September (projected 7pm US EST) to get everything ready for launch day. You will not be able to play Card Hunter until the game comes back online on the 12th of September (US Eastern Standard Time). Launch Special – Get the Basic Edition, Get Figures Cheap! To celebrate the launch of the game, we’re running a special promotion. 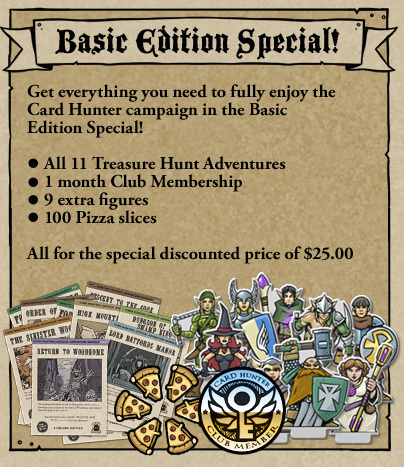 Jump into Card Hunter at launch and get the new Basic Edition! The Basic Edition contains everything you need to get started, including all the single-player content, extra figures, Club membership and more. If you haven’t already started playing, the Basic Edition is a great way to get into the game. In addition, to supplement this, we’re lowering the prices on the nine adventurer figures that are included in the Basic Edition. If you’ve got pizza to spend, you’ll be able to pick up any of these figures for less than half price in Cuthbert’s Costumes! Why Did Beta Take So Long? The biggest reason is that we wanted to stress test our server infrastructure to ensure that it could accommodate lots of players. We very much hope that we now have a stable and scalable game. However, we’d really value your patience as we work through the challenges of growing the game. Is This the End of Development? Heck, no. Unless the game tanks and we all have to go and get real jobs. We very much intend to keep working on the game and will update you with our plans as we go. We have big ideas for improving Card Hunter. In the future will be more cards, more items, more adventures and many more things beyond! Will There Be Any More Account Resets? Finally, we wanted to say a heartfelt thank you to the ladies and gentlemen of the forums. We can’t thank you enough. We’re sure we’ve left many people out here but we want to say a special thank you to the folks who were tireless in their work in making the forums a happy place: SirKnight, Pengw1n, Wozarg, Assussanni, Lance, Jayce, Phaselock, Zalminen, Neofaolcon, Skip_intro, SurgeonFish, Roshirai and MightyMushroom, we salute you! Finally, please join us in the conversation in the forums at forums.cardhunter.com/ and let us know how we can keep on improving the game. We read them everyday. You can also follow us on Twitter: @BlueManchuGames and @JoeWMcDonagh. Onward brave Card Hunters! I’m kind of pissed. I only found out about this game by watching someone’s livestream, and it looked amazing. So, I signed up for the beta. Now, 3 months later I get the pleasure of finding out that the game is coming out in just over 2 weeks! Real glad I got signed up for the beta and waited on this game, so that I could have just not wasted my time since I was gonna get stuck waiting for the full game to come out anyways. I’ve lost interest in the game, and after checking my e-mail probably 100 times regularly and recieving nothing, I don’t really care about the finished game. I feel that this if this is the kind of service that comes with going with you guys, why waste my money? Supposedly everyone who signed up for beta should have gotten a key at this rate – you sure your code didn’t get stuck in a spam filter somewhere? Also, keys have been posted daily in the forums and every beta player even got friend codes to give out. Hardly what I’d call bad service tbh. There’s even new keys posted 10 minutes ago from this post. Yes, I’m positive it didn’t go in the spam folder. I have been checking just about everyday. I wasn’t expecting for there to be keys in the forums, who does that? I was expecting one to be sent to me, not for me to have to go find it in some forum. Where are you seeing these keys, because I’m not seeing them anywhere? I heard about this game about 1.5 weeks ago from a friend who gave me a beta key and now I am HOOKED! This is one of the best and well thought out games I have played in a LONG time. The best part it is free, and FAR from a pay to win. I plan on throwing down the initial $25 for the basic starter special to show my support more than anything else. That aside, I haven’t spent a penny in the beta and have been loving every second of it and not one time have I thought to myself “man, if I just spent some money this would be so much better”. It is one hell of a game and has masterfully combined nearly every one of my favorite genres into one: Table Top RPGs, Video Game Tactics, or Strategy, RPGs, and CCGs. The story-line is great, the art is great at every level (from the backgrounds and maps to the cards and figures), and it feels nothing like any of the crap that is usually associated with a browser based game. I would give this game a 9.5/10. I’m looking forward to release – I’ve been wanting to play without worrying about my progress being reset for a long time already. I might just be speaking for myself here, but I’ve found it very fatiguing, wanting to play Card Hunter but not wanting to have to play all the same missions and find the same loot all over again. The easiest way out of that mental conflict is to simply forget about Card Hunter entirely, and you guys may have lost a chunk of your potential fan base this way. If the main purpose of the beta period was to test server infrastructure, then the beta really should have been open from the start. Let the players flood in, sort out any server issues, hammer out some bug fixes and release the game ASAP. Awesome. I’m happy for the game to go live. Totally alright with the reset. Thanks for making a superb game. I look forward to throwing more pizza at you. Is the game still free to play? If it is, is there content that is accessible only by purchasing it? What does the monthly Club membership offer? Creaphis> There’s been some 40 k testers. Not sure how many simultaneous players et c, but we’re already playing on live servers – so that bit is pretty much tested it seems. Narkon> It’s still F2P, there are treasure hunts that’s purchaseable content – and more along the line of great optional sidequests – i e, there is no paywall in progress et c.
The club membership offers additonal loot to every chest – for chests with set rarity drops – i e treasure hunt final chest and mp ones, that’s an additional piece of loot of that rarity level. A small update with the actual down-time for the server: 7pm EST (US) on the 10th of September. How DOES one purchase “Basic” membership? I don’t see it on the website. The two “Plus” icons In Game offer to purchase memberships, or pizza; I don’t see any combos or basic editions? @Nikola, you should see the Basic Edition as the first menu item in the pizza menu (click the plus button next to the pizza at the top of the screen). Is the Starter Edition a limited time item? Will it ever go on sale? I have been burned by too many games offering a “pack” of some kind, only to have it go on sale in a few weeks with more stuff. How long will this basic edition be around? The Basic Edition is already heavily discounted compared to purchasing the parts individually – so I doubt it’ll get cheaper. As for how long it will be on sale is harder to say – probably for the forseeable future. There is no sense of “buy now or risk missing it” in their sales pitch.